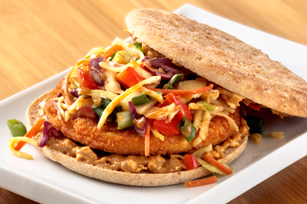 Spicy veggie patties dressed with crunchy peanut butter and coleslaw give this sandwich a Thai-style flavor. Cook patties as directed on package. Spread cut sides of buns with peanut butter; fill with patties and coleslaw. Prepare using your favorite flavor of nut butter. Prepare using 1 pkg. (10 oz.) frozen BOCA Meatless Original Vegan Burgers.